You’re about to learn of a fiscally conservative, market based solution to the climate crisis that reduces government regulations, boosts economic growth, creates millions of jobs, save thousands of lives per year and reduces greenhouse gases and has the endorsement of leading economists and world-famous scientists. I find it very difficult to argue with her statement. However, many experts believe solution exists somewhere in between Naomi Klein and Milton Friedman, in fixing capitalism, not overthrowing it. Don’t be so quick to dismiss capitalism as a tremendously powerful force to drive human behavior and major financial moves. Right now capitalism is very broken. It’s being misused, mismanaged, and even hijacked. And when it comes to our energy economy, it is completely bastardized. Milton Friedman is turning over in his grave. Please take a moment to consider the benefits being put forth, an economic boost, job creation, and restoration of free-market capitalism! The issues at hand are of such great urgency and importance that none of us can enjoy the luxury of expecting everyone to do what needs to be done for the same reasons you or I have. Our need power our world by continually burning of fossil fuels results in serious consequences for our planet, our economy, and the way we live. Our very way of life is threatened. Burning of fossil fuels results in the release of heat-trapping gases to our atmosphere. This is not disputed. The costs associated with this are immense. They include: downwind emissions that shorten people’s lives, sea-level rise (SLR), extreme weather, increased wildfires, ecosystem and biodiversity loss (including crop loss), dying coral, famine, floods, mudslides, damaged fisheries, and a national security risk in the form of climate refugees. 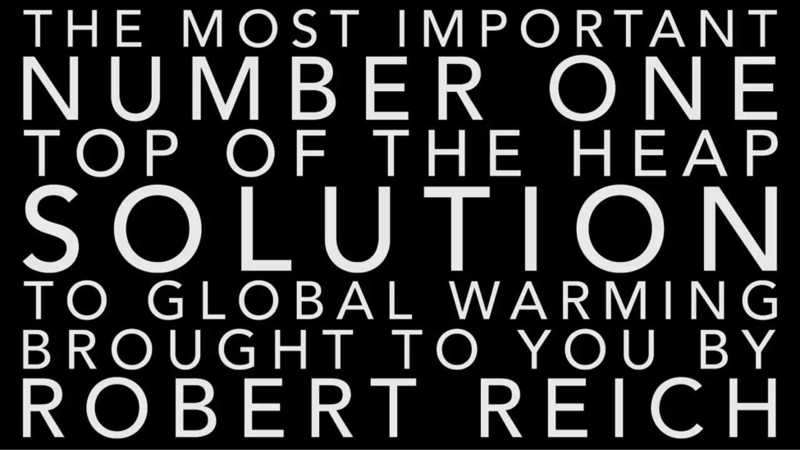 (See documentary: “Climate Refugees” with Newt Gingrich – trailer). The big issue for us in South Florida is clearly sea-level rise. In fact, Miami is ground-zero for the economic impacts of sea-level rise with the greatest value of assets at risk in the world. SLR is the result of a warming planet. Over 93% of the Earth’s trapped surface heat goes straight to the oceans. Thermal expansion of ocean water and melting of land-based ice results in sea-level rise. Here in S. FL, the seas have risen nearly 9 inches in the past 100 years, as measured by the Naval Air Station in Key West. During super high-tides, sea water is delivered into our streets through the storm sewers. (Sea-level rise in action) The City of Miami Beach is undertaking major infrastructure improvements, raising sea-walls, roads and sidewalks, and installing pumps to return seawater back to Biscayne Bay. The first phase of this project included four pumps at a cost of $15 Million. The entire project will involve 60-70 pumps with a whopping price-tag. With assets in the trillions to be protected, we need to do this, but we also need to fix a big accounting error. Our broken energy economy bears little resemblance to a free-market economic model. The price on fossil fuels does not reflect the social costs. Energy subsidies (picking winners and losers) serve to create deeper market distortions. Top-down government regulations can be inefficient and costly, and receive consistent pushback from ‘free-market’ purists and industry groups. The President’s new Clean Power Plan is an aggressive and effort to tackle GHG emissions. So what’s the problem? Half of the states are already protesting it. Our energy economy is broken. Very broken. Nobody argues with this. Another problem we have are elected leaders who are driven by fear, short-term interests, and often re-elected by low-information, similarly fearful voters. I submit that most of these punters, these ‘slow-lane’ Americans who waffle somewhere between “let’s keep it in neutral” and “more CO2 release is good for us” are actually quite scared. But they’re not afraid of the science. They’re afraid of the solutions. They fear that anything we do to reduce greenhouse gas emissions will tank our economy. Many people truly believe this, conservatives and many liberals too. And they’re wrong. What we have at hand is potentially the biggest job-creating economic stimulus ever seen… if we get it right. But what if we don’t? It’s not like it’s the end of the world, right? Wrong That’s exactly what it means. Our survival on this planet depends on getting this right, and fast. We can’t afford to punt. We need a big play. We need to fix the accounting error. The moment we begin to account for the social and environmental costs of carbon based fuels, the markets will shift. Our energy economy is nothing at all like the “free-market” Milton Friedman envisioned. Would you help to restore true, free-market principles, remove the socialism from the system, help restore capitalism and fix our energy economy? Consider dealing with this issue the Reagan way. Capitalism is a big word, with many flavors. Leading economists realize we’re getting it wrong and that a correction is in order. Experts think more plausible, and certainly more politically viable to plug the holes in capitalism rather than swap it for an entirely different economic system. That would require nothing short of a revolution. Are you ready for that? Me neither. There’s one plan that could put us on the right track. The Washington Post called it the most politically viable solution to reducing greenhouse gasses, and it is consistent conservative economic principles. The carbon fee + dividend (CF&D) plan was written by a Republican icon, George Shultz, President Reagan’s Treasury Secretary and Secretary of State, and Nobel laureate Gary Becker. It calls for a steadily-rising revenue-neutral carbon tax collected at the most upstream point — the mine, well, frack pad — (about 1600 points of collection in the U.S.) and rebating those fees back to American households. All of it. This is not a big government plan. In fact, it trades in current big government regulations and subsidies for a simple, more honest, market-based plan that fixes the accounting error. This plan is consistent with conservative economic principles by embedding the true cost into the price we pay for our direct and embodied energy. When happens, market actors change behavior almost immediately. When the markets move in this direction we’ll be on our way. Suddenly all those green jobs we’ve wanted start taking off. American ingenuity and competition is unleashed. Read about the Shultz-Becker Carbon Tax proposal in this WSJ article (or see PDF). This is a call to my fellow Americans. Let’s fix capitalism! Let’s restore some honesty into the system. What we need is political will for a livable world. 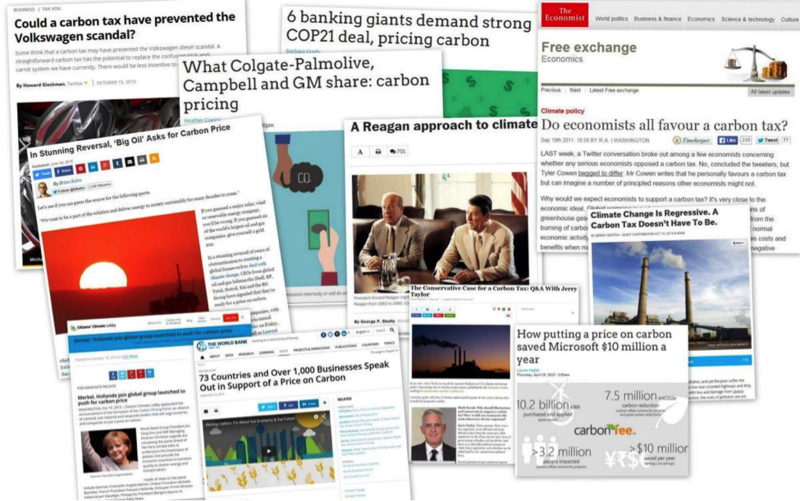 We need a price on carbon, a carbon fee & dividend. The Case for a Carbon Tax: Getting Past Our Hang-ups to Effective Climate Policy – 8-page opinion by FSU economist, Shi-Ling Hsu.